Tulsa Attorney BlogWould NTSB’s Lower DUI Blood Alcohol Limits Save Lives? The National Transportation Safety Board today released a report calling for reduction of maximum blood alcohol limits for drivers from .08 to .05. The NTSB’s recommendations may find purchase among legislators looking to get tough on drunk driving. As a Tulsa personal injury attorney who represents clients seeking to recover damages in accidents caused by drunk drivers, and who also provides Oklahoma DUI defense representation, the report raises some interesting questions for me. As a daily driver, a husband and a father, I’m naturally concerned with reducing the risk of death or injury on the highways. As a trial attorney and taxpayer, I’m a bit curious how the actuarial science works out when efforts to reduce traffic deaths associated with low level of blood alcohol are compared with other possible initiatives. Of course, it’s not always an either-or case. But it just might be the case that reducing the number of drivers using cell phones, increasing the number of drivers who buckle up, or spending money to make intersections safer would be more productive than pouring more money into DUI enforcement for such marginal levels of blood alcohol. If we just want to reduce the number of accidental deaths and get the most “bang for the buck,” efforts that significantly reduce the number of drug overdose deaths might perform as well as enforcing a lower blood-alcohol level among drivers. A focus on reducing substance abuse might have an added benefit of reducing the number of drug-impaired drivers behind the wheel. There’s little doubt that alcohol is a leading indicator of traffic fatalities, but there’s plenty of room for debate about where to set the limits, The NTSB study indicated that drivers with .08 percent blood alcohol were more than 2 ½ times as likely to be involved in a fatal crash as drivers with no blood alcohol. At .10, the risk surges to more than 4 ½ times as likely. But at .05, drivers are only about 1/3 more likely (38 percent) to be involved in a fatal crash than drivers with no alcohol in their blood. The title of the NTSB report released today reveals the bureau’s strategy; it’s called “Reaching Zero.” While reducing the number of drivers in crashes who have discernible blood alcohol levels to zero might appear to be a worthy goal, it doesn’t mean the number of crashes would necessarily be reduced. The old adage says “correlation is not causation.” Those drivers with marginal blood alcohol levels might or might not be risk takers in other domains – especially speeding and cell phone use. Speeding has also been shown to be a major factor in traffic fatalities. Of 33,808 fatalities in 2009, speed was a factor in about one out of three. Half of the speed related accidents occurred on non-interstate highways at speeds under 50 mph. 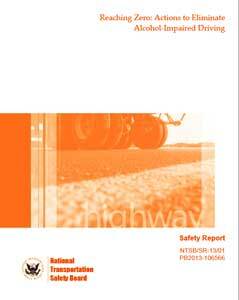 The NTSB’s report addresses safety factors that fall within its area of interest – public regulation of human behavior. Human behavior is certainly a factor in accident survival – half of accident fatalities in 2011 involved motorists not wearing seat belts or using child restraints. But the study doesn’t compare the benefits of reducing blood-alcohol limits with other potential public policy initiatives. Would money be better spend fixing high-risk intersections or prosecuting more drivers with blood alcohol rates of .05? That’s a good question, but current laws already allow for prosecution of impaired drivers, whose blood alcohol is below the legal limit but who appear to be driving while intoxicated. Chances are, taxpayer’s best investments might be focused on the 62 percent of highway deaths that aren’t alcohol related rather than the 4 percent who fall in a narrow margin already addressed by current laws. Safer intersections, more advanced traffic control signals, even speed limit enforcement and seatbelt-use enforcement might score higher in an actuarial analysis of prospective risk reduction measures. Either way, as a Tulsa DUI defense attorney, I’ll continue to provide representation to drivers arrested for driving under the influence. I’m also likely to be asked sometime to help a person injured in a drunk driving accident recover damages. My advice? When you get behind the wheel, pay attention. If you get arrested, or you were injured and it’s someone else’s fault, call a Tulsa attorney. For a free consultation, call me at (918) 879-1681 (or toll free at (888) Wirth-Law) or submit the question form at the top right of this page.